Why did you use staples to close my incision? Stitching with sutures or staples are cosmetically equivalent, and the choice of staples tends to allow for rapid skin closure with minimal wound inflammation, and are easier to remove than stitches. While surgical &super glue& can be used to close surgical incisions, Staples provide a stronger closure for more mobile surgical sites required for post operative rehabilitation. More than likely, and TSA won’t accept a card or Surgeon’s letter, so be prepared for a secondary inspection. 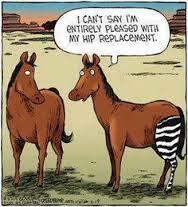 Why Is The Outside Of My Knee Numb After Knee Replacement Surgery? The lateral side of the knee is numb initially after surgery because the skin nerves travel from the inner (medial) side of the knee to the outer (lateral) side. They are cut when we make the incision and the sensation may return in first year or may remain numb. How Much Does The Prosthesis Weigh? The prosthesis generally weighs less than a pound and we also remove some bone so it comes out pretty even. After My Hip Replacement, My Foot On That Side Is Swollen. Why? Is it normal for my knee to feel warm? Yes,for up to about 9-12 months. The warmth comes from your body’s healing, increased blood flow and to the surgery itself. One of the best gauges you’ll have for knowing when the warmth should go away is when the scar completely fades to the color of your skin. The reason we don’t want you to kneel on your kneecap is because during surgery, we thin the kneecap. Therefore, theoretically, the thinned kneecap is weaker than the original. Also, when kneeling a great deal of stress is put on the polyethylene cap that we’ve placed inside your knee. If you must kneel, such as to pray or perform a particular aspect of your job, we ask that you kneel on the upper part of the shinbone. You can find the area for safe kneeling by feeling your kneecap and moving your hand towards your ankle. You’ll feel a knot on your leg where the tendon attaches. That’s where we want you to put the pressure when you kneel. Is popping/clicking in the knee normal? We prefer that the knee be completely quiet, but popping is not uncommon. 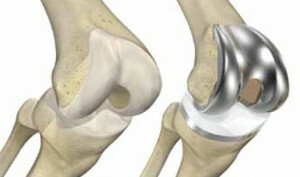 The popping is caused by scarring in the knee joint as a result of the surgery. Most of the time popping will resolve at about the same time the warmth resolves. However don’t be alarmed if you have some occasional pops for the remainder of the knee’s life. How long will the scar be red? Some people lose the redness by 3 months and other people take 15 months. As long as the scar is red, remember that you’re still healing. When he’s not assisting Dr. Salvagno in the OR or taking out staples at CJS, you can find Ron working at Urgent Care. In his spare time, you might be lucky enough to catch him moonlighting as Ronnie Ray, a very talented blues musician. Most individuals are more inactive during the cold winter months, but before we know it, spring will be right around the corner. When warmer weather is upon us, we will have more options to get outside and get moving. Until that time, in order to maintain overall health and wellness, and avoid the risk of injury when the weather does improve, it is important to participate in an exercise program. Only exercise to your level of health and make sure you are cleared for physical activity by your physician prior to starting any new exercise regimen. Begin by exercising three times a week for 30 minutes of moderate cardiovascular and light strength training. 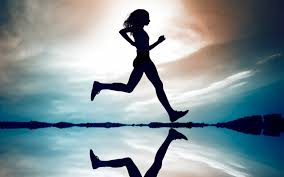 Allow time for both warm-up and cool-down with exercise, approximately 5-10 minutes. Light impact activities (i.e. walking, biking) are a good way to exercise without placing additional stress on your joints. Strengthening of your legs is also important for function and protection from injury. By increasing muscle strength, you can give support to the joints and allow energy conservation with daily activity. 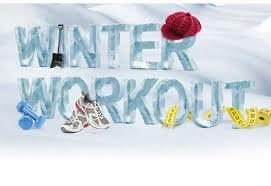 Winter is often a time when muscle tightness increases due to decreased activity. Make sure that you are taking time to stretch your muscles to maintain flexibility. Stretches can be done daily and should be held for 15-20seconds and repeated 2-3x for each muscle group. It is not uncommon to have muscle soreness after starting an exercise program. A day of rest between exercising will help to decrease the onset of muscle soreness. If soreness does occur, ice can be used for 10-15 minutes. If you suffer a minor injury to a muscle or joint, make sure to rest. To avoid further injury or inflammation, you should elevate and ice the area 10-15 minutes, several times per day. -The Center for Joint Surgery Physical Therapy Team. If you have further questions or concerns, please do not hesitate to contact us at the Center for Joint Surgery and Sports Medicine (240-452-3205). It’s a great year to be an athlete in the Washington County Public School system. For the first time in this county, there are athletic trainers on staff at every high school within the public school realm. 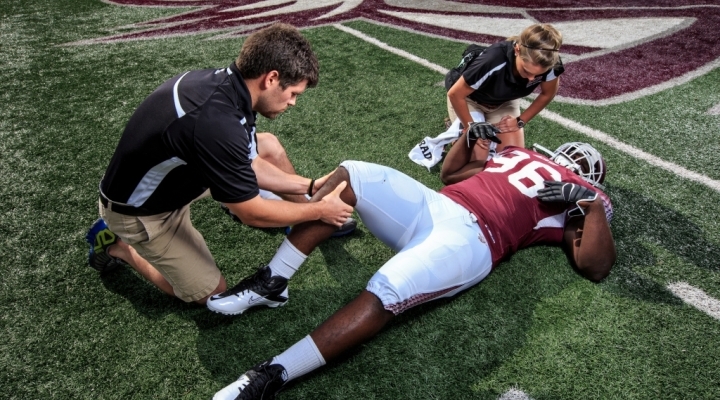 Having athletic trainers as part of the team approach to treating our student athletes has been something that the staff at the Center for Joint Surgery and Sports Medicine have been advocating for for many years. We have seen surrounding counties successfully integrate athletic trainers into their schools, and now this year, we are very excited to have them join our team as providers of care in Washington County!!! The National Athletic Trainers’ Association defines athletic trainers as, “health care professionals who collaborate with physicians to provide preventative services, emergency care, clinical diagnosis, therapeutic intervention and rehabilitation of injuries and medical conditions. Students who want to become certified athletic trainers must earn a degree from an accredited athletic training curriculum. Accredited programs include formal instruction in areas such as injury/illness prevention, first aid and emergency care, assessment of injury/illness, human anatomy and physiology, therapeutic modalities, and nutrition. Classroom learning is enhanced through clinical education experiences.” Once obtaining at least a Bachelor’s degree, and many go on to obtain a Master’s degree, an athletic trainer must pass a certification exam in order to become licensed to practice. To maintain their license, they must adhere to their state practice act, take continuing education courses, and have a physician sign off on their certification. As part of a team of healthcare professionals, athletic trainers play a vital role in the treatment of an injured athlete. Their expertise and skill set in the assessment of injuries that occur on the field or court during games and at practices is the first step in getting an injured athlete safely back on his or her feet and into the game. They have an important role in both rehabilitating the injured athlete if the case requires only conservative interventions, as well as recognizing the need for further diagnostic testing or interventions by a physician. If an injury requires surgery and/or long-term rehabilitation to restore motor control and proper functional mobility, they may also work directly with physical therapists to return an athlete to their sport. This team approach to caring for our student athletes will effectively and efficiently return athletes to their sports with the least risk of further injury. The Center for Joint Surgery and Sports Medicine is very excited about the addition of athletic trainers in Washington County. We are looking forward to developing professional working relationships to best serve our community and our student athletes. If your son or daughter does incur an injury, please know that our office is available to assist your needs. We will do our very best to have any injured athlete examined by a healthcare provider within 24 hours of their injury. We wish the student athletes and the athletic trainers in the Washington County and the Tri-State area the best of luck this 2014-2015 school year! Jolee Ashley, DPT, CCRP is a physical therapist at the Center for Joint Surgery and Sports Medicine. She has been in practice for 7 years and has a love for orthopedics and sports medicine. She enjoys partnering with her patients to achieve their goals and to help rehabilitate them so that they, too, can get back to doing the things that they love. Female athletes have challenges to face with their sports that males often do not. Here are some tips to help females stay healthy and allow them to remain in their sports. Females have higher incidences of knee injuries for a variety of reasons. 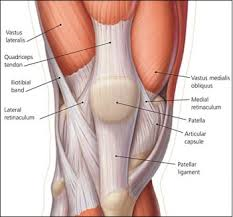 They are much more at risk of tearing the ACL (anterior cruciate ligament – in the front of the knee). We feel this is related to several factors. Females tend to have more weakness in their hamstrings (muscles in the back of the leg). It is important to make sure the hamstrings are strong to help protect the ACL. Sports like volleyball and basketball, which require constant jumping, require good hamstring strength to assist the athlete in landing from her jumps. In addition, females have a wider pelvis than males, also putting extra stress on the knees. While we can’t change the pelvis, good strength and flexibility of the hip muscles can help protect the knees. Another challenge facing female athletes is called the female athlete triad. This is a combination of eating disorders, amenorrhea (lack of a period), and osteoporosis. These issues are found in females with frequent and intense athletic participation. Eating disorders can be either anorexia (lack of eating) or bulimia (binge eating). Athletes will do this to control their weight and often end up underweight and undernourished. Amenorrhea can either be defined as late onset of puberty or no menstrual cycles for greater than 6 months. Rest from an intense athletic schedule often helps restore a normal cycle. Osteoporosis is characterized as loss of bone mineral and often comes from amenorrhea. Bone loss can be stopped with return of menstruation, however, the bone that is already lost cannot be replaced. This can cause future risk of fractures to hips or spine. If you are or know an athlete with any of the triad symptoms, you should consult your family MD. Any questions about female athlete knee injuries can be answered at Center for Joint Surgery and Sports Medicine at (301)665-4575. Laura Blair is a physical therapist at Center for Joint Surgery and Sports Medicine.